Are Hebe products NZ made? The Hebe workshop is in Opua in sunny Northland. This is where all Hebe furniture is designed, made and shipped from. 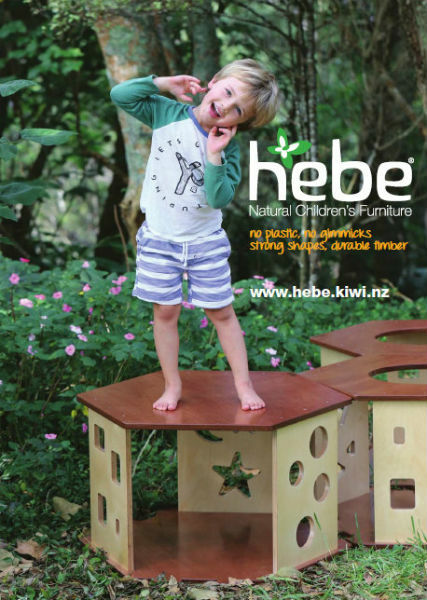 Hebe products are made from natural non-treated sustainable plywood and locally milled timber and are finished with non-toxic natural oils or paints and varnishes that carry the environment care label. We also use recycled packing material where we can for shipping. How do I know I'm getting value for money? Hebe's products are built to last. We stand by our products with a lifetime structural warranty. What if I want something that's not in your catalogue? Do you do any other colour schemes? While we are big fans of the natural wood look, we are able to create a colour scheme to suit your needs with different materials and paint finishes available. How long does it take once I place my order? Small orders have a two to three week lead time. For larger orders or custom builds this may take longer. Full kit outs should allow around three months depending on size. We can advise you when you order and will endeavour to get things to you as quick as we can. We will either hand deliver or use a courier service depending on your location. We always work to get the best price we can for you. Once you have provided a delivery address and the list of items you would like to order we will send you a full quote including delivery costs. We can send quotes in any way that suits your needs. How long does the quote last for? Generally quotes are valid for 30 days. We understand that budgets and grants can take a while so feel free to chat to us about keeping your quote live for a bit longer if needed. For commercial centres we will send an invoice once the order has been dispatched with payment due 14 days from date of invoice. For private buyers the invoice will need to be paid prior to dispatch. We will send an invoice with our bank details, please use the invoice number as a reference. We have teamed up with a reputable lender should you wish to purchase on finance. Please contact us direct to discuss options. Hebe will repair or fix any structural issues with your items (this excludes wear and tear, misuse, any appendages and seconds sale items.) We want you to be happy, please contact us in the first instance with any questions. How do I look after my Hebe furniture? Can my Hebe furniture be left outside? Can I book you in to come visit my centre? Where we can, we are happy to come and visit you, help measure up as well as advise on layout and design solutions.